Weather I, San Jose, Costa Rica, a photo by crclapiz on Flickr. 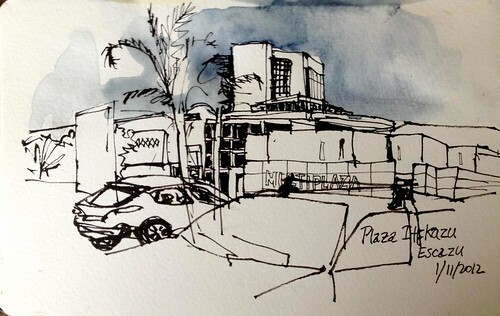 Mas nubes en la tarde - dibujando el Multiplaza desde la Plaza Itskazu. Big storm clouds approaching Multiplaza shopping center. Pluma de Hero, acuarelas Grumbacher, Moleskine watercolor pocket book.